Hey, Violet Beauregarde — rise and shine! It’s well established that we here at LunchBlogKC are big fans of QuikTrip. And we get more than a little excited when there’s a new rolling food to be had. So when I spotted the Blueberry Pancake Roller sign on the way to work the other morning, I had to stop and try one. I may have actually tried this new item three times over the past few weeks — and I’ll warn that it may not be for everybody. It depends on your affinity for bready breakfasts. 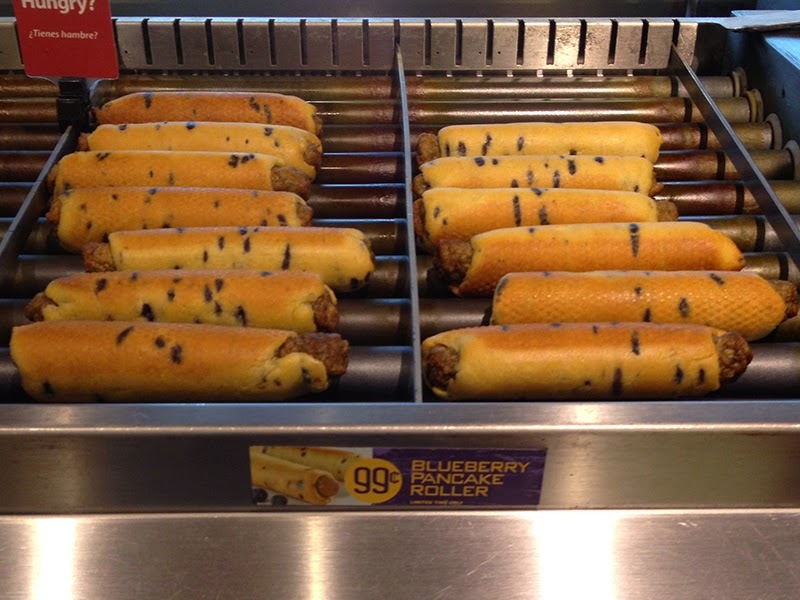 The Blueberry Pancake Roller is pretty dense, and while it’s tempting to get the “2 for $2.22*” roller food deal, you likely won’t need the second. Flavor-wise, it’s a nice balance of salty and sweet, meat and bread. I didn’t even run into any of the gristle bits typically found in this kind of sausage link. Gristle bits are the worst. I couldn’t tell if there was any built-in maple flavor to the pancake part. While it's good by itself, more sweet-toothed patrons might want to add extra syrup. Maybe look around and see if QT has any complimentary syrup tubs at the condiment bar. Overall, the Blueberry Pancake Roller is a fine addition to the morning lineup — probably my favorite of the rolling breakfast options. And I’m so happy to live in a world where it’s possible to eat blueberry pancakes while driving.